MANSFIELD, Mass. – (For Immediate Release) Good things come in small packages and now, so do useful things! Zoë Dog Treats from the Rolf C. Hagen (USA) Corp. are all-natural chewy morsels that are more than just canine snacks – they’re tools that offer real benefits for consumers. Zoë Tender Bites and Zoë Tender Chunks make irresistibly healthy training rewards or treats and Zoë Pill Pops are stress-free medication dispensers for dogs. Zoë dog treats are made in Canada and include only North American ingredients – nothing from China. They include no corn, no wheat, no soy, no artificial flavors or preservatives – the type of treat customers feel good about feeding their dogs. What they do include are carefully selected ingredients that offer top-notch nutrition and delectable flavors. Zoë Tender Bites and Zoë Tender Chunks are soft & chewy, highly palatable dog treats. With only 4 calories per treat, they’re perfect as a snack or a training reward. Buckwheat is the staple ingredient, which is neither a wheat nor a grain. It’s a fruit seed related to rhubarb and considered a health food powerhouse that is gluten-free and protein-rich. That makes the treats perfect for consumers that have dogs with allergies or sensitive stomachs – and nutritionally rich for all pets. Both treat styles are Canadian-made, 100% natural and ideal for rewarding dogs every day. Zoë Tender Bites come in four delectable varieties: Pumpkin & Ginger; Peanut Butter & Banana; Apple & Cinnamon; and Vanilla & Mint. 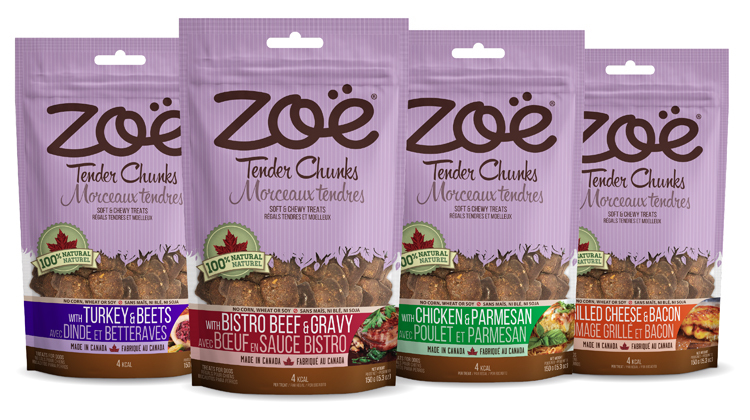 Zoë Tender Chunks are offered in four flavors: Turkey & Beets; Bistro Beef & Gravy; Chicken & Parmesan; and Grilled Cheese & Bacon. Zoë Pill Pops are meaty, chewy treats made to conceal canine medication. Like Tender Bites and Chunks, they’re soft, chewy and meaty with only select wholesome ingredients included. The Pill Pops are individually wrapped in 2-packs that hold in moisture and break apart to easily hide any size pill. The moist texture is moldable so the two sides can be sealed back together, hiding the medication. The delectable scent also conceals the meds, making dogs eager to participate – it makes inserting pills more pleasant for pet parents, too. 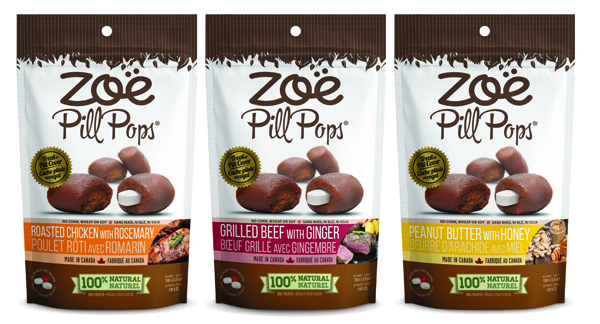 Zoë Pill Pops come in three delicious varieties; Roasted Chicken with Rosemary; Grilled Beef with Ginger; and Peanut Butter with Honey. The name Zoë translates to the Greek word for “life” – it was carefully chosen to represent the company’s feelings about the joy and fulfillment dogs bring to people’s lives. The Zoë product line embodies this philosophy — Every nutritious ingredient is carefully chosen and focuses on the optimal health of dogs. These are philosophies customers can truly get behind. Zoë dog treats from the Rolf C. Hagen (USA) Corp. are nutritionally complete and completely useful to keep dogs of all shapes and sizes healthy, happy and well behaved. Zoë Tender Bites are ideal training rewards that have an MSRP of $4.99. Zoë Tender Chunks are nutritious anytime treats with an MSRP of $6.49. Zoë Pill Pops offer consumers a simple, stress-free way to give pets their medication and are offered for an MSRP of $6.49.